Semlor buns. Cardamom buns. Herring, raw. 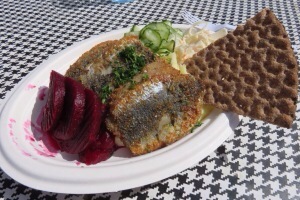 Herring, fried. Reindeer. Meatballs. Toast Skagen. Jansson’s Temptations. 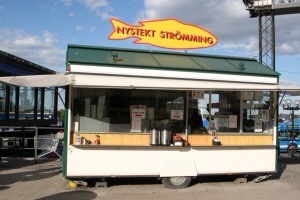 Smørbrød. We got a little late start and decided that we should skip breakfast and go for “brunch.” What better to eat at 11 AM than fried herring. We shared a plate with mashed potatoes, pickles, cole slaw, beets and that flat crisp bread that comes with everything. Delicious.